We are bringing wine country to Union City! 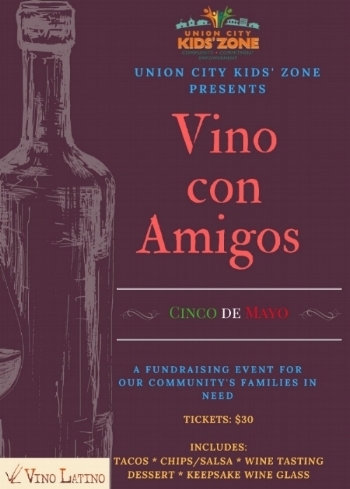 We are inviting our neighbors, community partners and Bay Area wine lovers to our Union City Kids’ Zone’s 2nd Annual Vino con Amigos fundraising event to be held on May 5, 2017 at the Ruggieri Senior Center in Union City as we party with a purpose! This event is co-sponsored by New Haven Schools Foundation. Payment: Pay at door the day of the event, and only cash or checks will be accepted (checks payable to: Union City Kids' Zone). We apologize that no credit or ATM cards will be accepted. The funds raised through this event will directly benefit our families in need of assistance with emergency living resources to include shelter, food, clothing, and other day-to-day living necessities. It’s no secret that our community is in need, especially children in our New Haven Unified School District. Union City Kids’ Zone is a welcoming, safe and non-judgmental place for families to come and receive help and resources through a partnership of schools, community, public and private organizations all working together to foster empowerment, quality education, wellness, and offer economic opportunity to families. It’s proven that students achieve at higher academic levels, families are more likely to set goals and priorities that include college and career preparation for their children, if their family isn’t worrying about their basic needs. We aim to be the bridge that connects families with what they need to build the success of their families from within their home first and then in turn, to the fabric of our community. Through KP LAUNCH, Kaiser Permanente offers unique and dynamic health care internship programs that provide interns with practical job skills and experiences in a supportive environment. As a school or community organization supported by Kaiser Permanente, we invite you to encourage your youth to apply for the 2017 program. This internship program provides youth from under served communities and diverse backgrounds a paid full-time work experience for eight weeks over the summer. While working, interns gain exposure to various health careers that they may choose to pursue after high school graduation. The summer 2017 program at the Kaiser Permanente San Leandro Medical Center is scheduled to begin on Monday, June 19, 2017 and end on Friday, August 11, 2017. Application materials are attached to this email for you to print and distribute to your eligible youth. The program prioritizes the selection of junior and senior high school students and recent high school graduates; others are welcome to apply. Applicants who are dependents of Kaiser Permanente employees are ineligible to participate in the KP LAUNCH summer internship programs. Thank you for applying to be our new partner in the Teen Eco Apprenticeship program. This is a free week-long intensive program where teens (age 13-17) learn more about their Regional Parks through environmental education, outdoor recreation, service learning and leadership development. The Park District provides transportation, gear, food, and staff to lead the program. We also provide a $100 stipend to youth who successfully complete the program. We ask our community partners to recruit 20 teens who are passionate about the environment yet can’t afford or access outdoor opportunities. We are currently seeking a new community partner in the Fremont/Union City/Newark/Hayward area who will work with us to promote, recruit, and guide 20 youth through this opportunity, which will take place July 31st to August 4th, 2017. We will hope to continue the partnership for many years after that. East Bay Regional Park District is conducting a Community Needs Assessment to determine the interpretive (environmental education) and recreation programs needs in your community, as well as identifying any barriers your community faces in accessing parks and programs. Your input is invaluable in helping us identify program gaps and breaking down access barriers. This survey is being sent to schools, non-profit organizations, religious organizations and other various agencies for a well-rounded representation of our community. We would greatly appreciate your participation. We will carefully consider your input to shape our future interpretive (environmental education) and recreation programs. If you have any questions, feel free to contact us. Thank you for your thoughtful responses to the assessment. This is the 2nd Searles Elementary School Collaborative Partner Meeting of the 2015/16 school year. We will be sharing our needs assessment data/ findings with you. 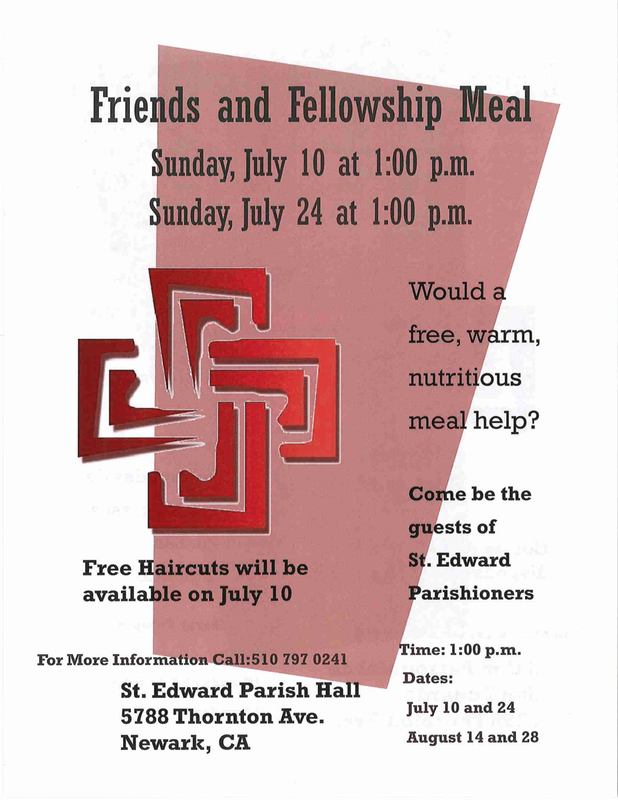 We look forward in our collaboration of services and hope to see you all there. Contact us if you have any questions. We have been told by Opportunity Fund that more Start2Save slots have become available. We have until March to fill as many slots as possible. Start2Save provides community-based organizations and social service agencies the opportunity to offer their clients a matched savings program where eligible applicants save for partner program goals and emergencies, participate in financial education classes and receive individualized financial coaching. We are pleased to invite non-profit organizations serving Fremont, Union City and Newark and providing services in the areas of public K-12 education, environment, social services/safety net and health to apply for a match grant of up to $5,000 from the Despeaux Good Works Fund at the East Bay Community Foundation (to be matched December 2015-March 2016). This short proposal (link) is due by November 20, 2015. Staff will get back to applicants late-November and may ask for full organizational budget, board list and demographic information about the people you work with. Please email nkyauk@eastbaycf.org with any questions. This new first-of-its kind firehouse clinic is located in south Hayward and as such will be providing a much needed service to families throughout the area, including of course, UC’s Decoto neighborhood, and beyond.